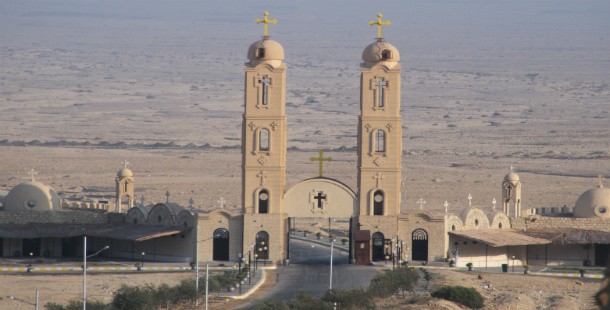 Saint Anthony Monastery is a Coptic Orthodox monastery standing in an oasis in the Eastern Desert of Egypt. Located 334 km (208 mi) southeast of Cairo, it is one of the oldest monasteries in the world, together with Saint Catherine's Monastery on Mount Sinai, which also lays claim to that title. The Monastery of Saint Anthony was established by the followers of Saint Anthony, who is considered to be the first monk. The Monastery of St. Anthony is one of the most prominent monasteries in Egypt and has strongly influenced the formation of several Coptic institutions, and has promoted monasticism in general. Several patriarchs have been pulled from the monastery, and several hundred pilgrims visit it each day. The Monastery has exceptional wall paintings of holy knights in bright colors and the hermit founders of the monastery in subdued colors and icons. These wall paintings, widely known to monks and art historians, were obscured by soot, candle grease, oil and dust, but recently, in a collaborated effort between the Supreme Council of Antiquities and the American Research Center in Egypt, these unique painting were restored. The oldest paintings date to the seventh and eighth centuries, while the newest are from the thirteenth century. In addition to the paintings, woodwork inside At. Antony's Church was also restored. Today it is a self-contained village with gardens, a mill, a bakery and five churches, the best of which is St. Antony's Church. Egypt monasteries are experiencing a revival, and the monk population of St. Antony's has grown considerably in recent years.